Of late, there is a worrying tendency in Tamil Nadu to protest anything from the Centre. Rather than presenting its case cogently and cohesively, Tamil Nadu acts very emotionally like a kid whose toy had just been taken away. The Washington Post columnist David Von Drehle, in a powerful piece this week, wrote: "Twitter offers an endless stream of faux events: fleeting sensations, momentary outrages, ersatz insights and provocative distortions." And those pointed words readily came to mind as the hashtag #GoBackModi trended on Sunday in an assumed show of protest to the presence of Prime Minister Narendra Modi in Tamil Nadu — he was in Madurai to lay the foundation stone for the AIIMS in Thoppur. As with most hashtag wars, there was very little organic traction. The Dravidian megaphones on Twitter (read: run by the DMK) went to town with anti-Modi tweets, and it was sought to be countered by the right-wing Twitter (read: the BJP) hashtag #WelcomeModi. Both camps claimed victory for themselves, but both were silly, especially because Twitter is hardly a reliable microcosm of the real world. If mainstream media reflects, social media platforms distort. But increasingly in Tamil Nadu, a section of the population has allowed itself to be led by the outcry on social media. When you follow distortions, your path usually ends in peril. It is not as if black flags cannot be shown to the Prime Minister or his visit protested against. Sure, such things have an important place in a healthy democracy. But why were they protesting on Sunday? The Prime Minister was after all in Madurai for the foundation stone-laying ceremony of a public hospital that will also provide 100 more medical seats in the state. Till the AIIMS was announced for Tamil Nadu last December, the same sections of the protesters were shouting against the Centre that Tamil Nadu was discriminated against as it was not being sanctioned an AIIMS. But on Sunday, they were demonstrating against a function for the AIIMS. As you can see, the bogusness of the protests shines through. 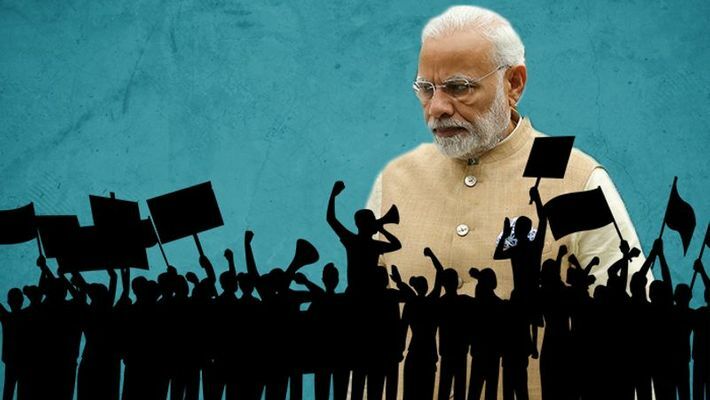 The argument that the outrage was against the Prime Minister's visit and not the AIIMS comes across as even more hollow, because the counter question would be, "if that be the case, why did they not protest when the Prime Minister was in Chennai for the death of DMK leader M Karunanidhi?" That it didn't happen will also make it clear that the DMK and its ilk are the ones orchestrating the campaign. They kept quiet when it suited them. When Karunanidhi died, Modi's visit was a matter of pride and prestige for them, and pictures were boldly splattered all across the DMK's party organs. Now, they are on the roof-tops shouting themselves hoarse against the Prime Minister. To give another example: The Congress is seen as a villain in Tamil Nadu over the issue concerning the Lankan Tamils, as it was during the UPA regimes that the Tamils in Sri Lanka were annihilated by the Lankan army and the LTTE was delivered a body blow. But still no black flag to Sonia Gandhi when she was in Chennai to unveil the statue of Karunanidhi. Oh! lest you forget, the DMK and Congress are long-standing allies. The real point is, in politics these things are common and understandable. It becomes problematic only when protests are artificially played up as some kind of organic people's movement. And of late, there is a worrying tendency in Tamil Nadu to protest anything from the Centre. There are issues on which the people of Tamil Nadu can feel aggrieved with the Centre. But rather than presenting its case cogently and cohesively, Tamil Nadu acts very emotionally like a kid whose toy had just been taken away. It reflects a disturbing lack of maturity. It cannot be a coincidence that the image of Tamil Nadu in the eyes of outsiders is one of a petulant, conceited brat. The state also suffers from a heightened sense of self-importance and a sense of victimhood. Aside from the Centre, a large section of Tamils feel that their state has been harshly treated by Kerala on the Mullaperiyar issue, by Karnataka on the Cauvery issue, by Andhra Pradesh on the red sanders smuggling issue. If it were an individual, Tamil Nadu would to be referred to a shrink for treatment of terminal persecution complex. Tamil Nadu politicos are feeding this tendency, especially among the youth, who are encouraged to be insular and xenophobic, and think that the rest of the world is ranged against them. The irony is that this cross section is the one accusing the right-wingers of being parochial and partisan. Right-wingers can indeed be dogmatic, but the Dravidian world view is stubbornly warped and bizarre beyond belief. In reality, it is actually no more than a strange shibboleth of conveniences and cussed conspiracy theories. Which naturally brings us back to Twitter where such tendencies get a free run. It is where the Dravidian types can assert that "the Prime Minister was rattled" by a trending hashtag, proving only — as Von Drehle wrote memorably — "how deeply they’ve confused the bot-infested echo chamber of Twitter with the world at large".